MODARTT is a company that develops and provides software, hardware and consulting services for artistic and technological applications. 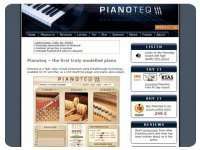 MODARTT also supports the KIViR project (Keyboard Instruments Virtual Restoration), offering digital restoration of historical keyboard music instruments present in museums. The Pianoteq model has been developed in the prestigious research laboratory MIP at INSA Toulouse, France. It is an innovating tool for music creation and can be useful not only to musicians but also to piano manufacturers and piano tuners for simulation and training purposes.